If your DIY move is approaching, you should definitely do some studying before the moving day comes, especially if it is your first time. Pre-planning makes packing a moving truck so much quicker and easier, plus, your belongings will be safer during transit. We have gathered some tips for packing a moving truck you might find useful. If you are renting a moving truck, it is very important to determine its size. Many people choose a smaller vehicle thinking they will save money. 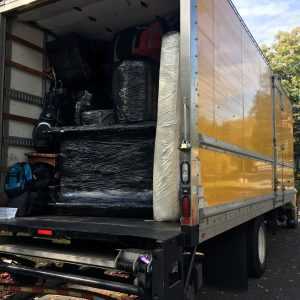 However, if the vehicle does not fit all of their belongings, they have to make multiple trips back and forth, spending more than they planned. Your NJ moving company should inform you about the size of the trucks that are available. After studying your options in detail and consulting your movers, you should be able to determine which truck is right for you. Moreover, check if the moving truck comes with a loading dock. If it does, unloading heavy items will be much easier. Packing supplies, like padding, will not only protect your belongings from damage but also make loading easier. Try to determine the amount of packing material you need on time. This way, you won’t have to run to the store at the last minute. You will need plastic wrap, blankets, boxes, tape, markers for labeling the boxes and probably a dolly for heavy items. You may also need moving straps for keeping your belongings in place. A lot of movers sell their own packing supplies. 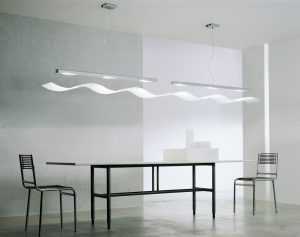 For example, the best furniture movers NJ offers will provide you with quality furniture pads or moving blankets. Alternatively, you can opt for renting packing supplies instead of purchasing them. It is important to disassemble items like furniture, lamp bases, and lamp parts before you start packing a moving truck for several reasons. First of all, the parts will be easier to carry. Second, the weight will be distributed more evenly. Third, you’ll maximize the space. Consider having a professional do the disassembling and reassembling if you are not sure how to do it. Wrap bed rails and disassembled table legs. Then, roll them into rugs or carpets. Remove couch cushions and put them in plastic bags or wrap them. Utilize self-adhering plastic wrap, paper padding or furniture pads to protect upholstered furniture. Wood and metal furniture needs moving pads or paper padding as well. Paper padding or furniture pads are necessary for packing framed pictures, mirrors, and marble tabletops, too. Use plastic wrap or packing tape to secure moving pads/paper padding. Be careful not to place tape directly on the furniture. Put the hoses from washers and dryers in plastic bags. Then, put them inside the units. 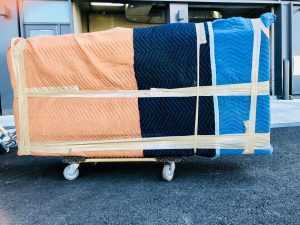 To make sure everything is properly packed, you can use the packing services NJ movers usually offer. They can pack everything for you or at least your most fragile belongings. Be generous with padding material so as to avoid scratches and other types of damage. Now that you’ve rented a truck and packed your stuff you need to know how to load it. If you’re packing a moving truck without the help of professional movers, you need to study the technique before you start. Yes, it is not as simple as it seems. The heaviest items are usually the largest ones, too. They include tables, chairs, and large appliances, such as dishwashers, stoves, refrigerators, etc. These items should be as close as possible to the front of the moving vehicle. Do not put these heavy items on top of other items – they should be on the bottom of the moving truck. In addition, make sure the weight is well-balanced, which means heavy items are on both sides of the truck, left and right. On top of the heaviest pieces of furniture and appliances come the heaviest boxes. These boxes should not contain fragile items. Be careful about the weight. For example, thin-legged tables may not endure the weight of the items on top of them. Place items like table tops, couches, mattresses, long mirrors, and headboards in an upright position, against the longest walls of the truck. Moreover, you may need to cover your mattress with a mattress bag. Moving straps can help hold these items in place. These items should come on top of the heaviest ones. Of course, nothing should ever be directly underneath something heavier or it will get crushed. Good places to put fragile items are also underneath desks, tables, and chairs, as long as the weight of the furniture is not on them. Stack boxes in rows until they reach the truck’s ceiling. The lightest boxes should be on top. Awkwardly shaped items should be loaded last, too. The last items to be loaded when packing a moving truck should be the ones you can use to fill the gaps. Do not use anything breakable to stuff the holes. What you can use are bags full of clothes, blankets, linens, and towels. You can fill the space between the top of the highest boxes and the ceiling with these soft items. Furthermore, you can use things like garage items, hangers, and shoes to fill any open space. Clear the route from the front door to the moving truck of all obstacles. Place a tarp or plastic wrap on the truck’s floor in order to protect it from dust or dirt. Pack an essentials box that contains items you’ll use on the move-in day. Place this box in the back of the truck, somewhere you can reach it easily, or bring it with you. When packing a moving truck, one or two people should stay on the truck while the others carry the items. Their job should be stacking and loading the items tightly. Previous Post Benefits of renting a portable storage containerNext Post What information and paperwork is the mover required to provide?